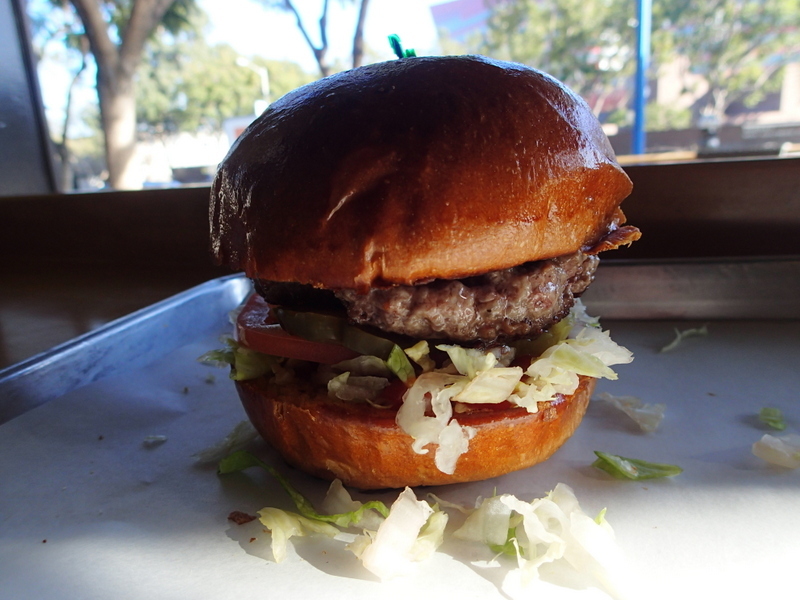 A Quest for the Best Burger in L.A. 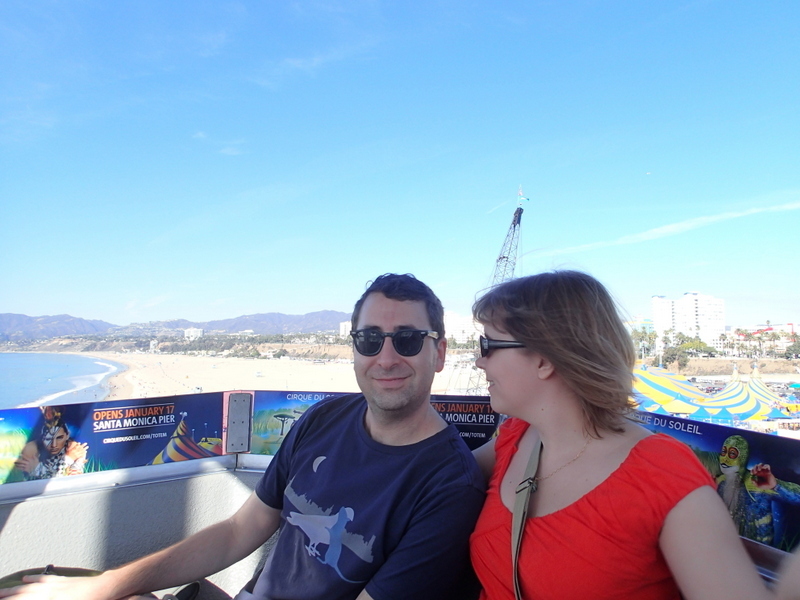 This whole crazy idea came about last year, when I tagged along with Andy on a work trip to L.A. I put out a call online for restaurant recommendations, and ended up with a lot more recs for burger places than I would have expected. 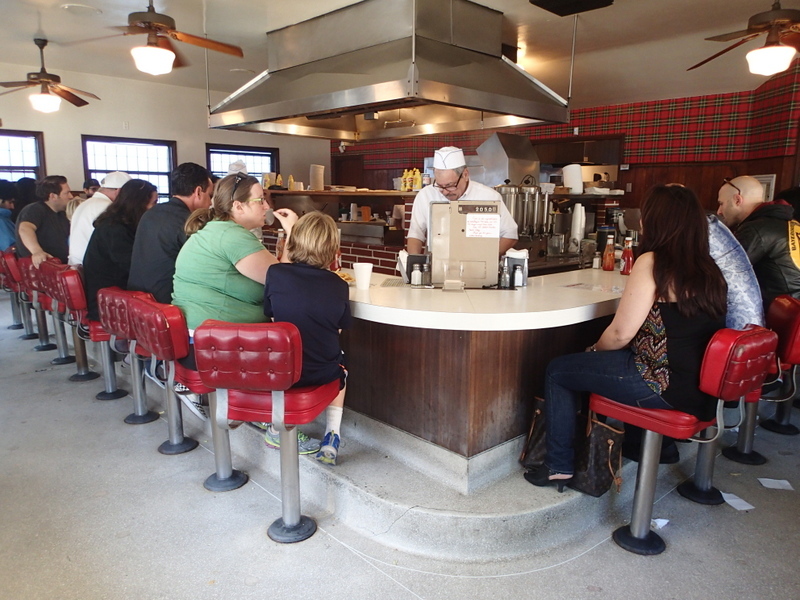 There wasn’t enough time to hit them on that first trip, but Andy and I vowed to come back and eat at as many as we could in an effort to find L.A.’s best burger. Our friends Katie and Jason, who live in L.A., immediately agreed to join us, and a quest was planned! In three days, we managed to hit nine places, running the gamut from humble fast food shack to high-end French bistro. I know that this doesn’t even begin to be comprehensive (I’m already compiling a list for next time! ), but it made for a decent sampling. So without further ado, here’s where we went and what we ate! 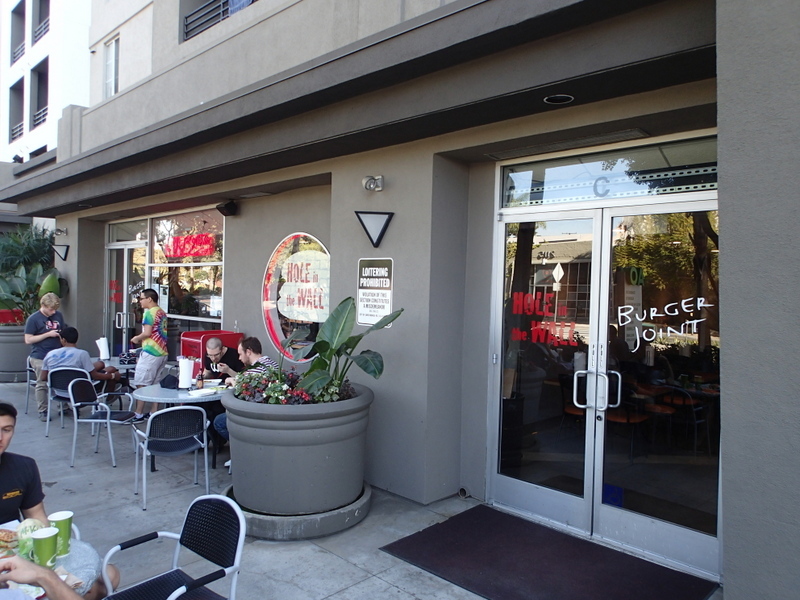 Hole in the Wall is a cute little fast-casual place with a decent-sized outdoor patio. 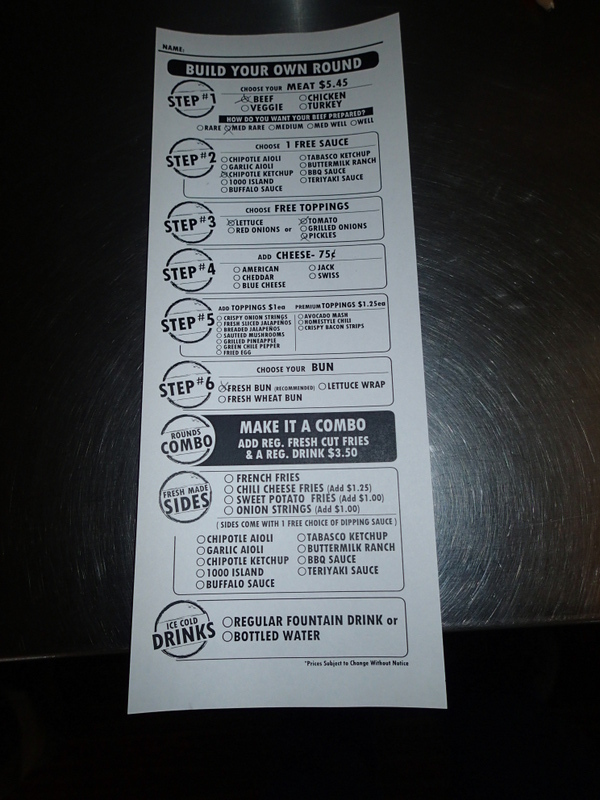 You order using a handy checklist. Andy and I kept things pretty basic, though we did go for the pretzel bun and the cranberry mayo, which sounded like the most fun of the spread choices provided. Katie and Jason got cheese on their burger, and tried the mustard pickle relish. Bun: Everyone loved the pretzel bun, though Katie said the bottom of hers got a little soggy and that the cheese was poorly distributed. Condiments & toppings: Andy and I found the cranberry mayo to be lacking in flavor, even when eaten on its own without a bite of meat. Katie and Jason gave the mustard relish a big thumbs up, though. The lettuce and tomato were fresh enough, though no one found them remarkable. Worth mentioning: The fries were solid–worth ordering. Also, Hole in the Wall had a great assortment of shake flavors (including peanut butter and malt), which, sadly, we did not try. But they also has a fridge full of awesome-sounding soda flavors, including Shirley Temple soda, Cheerwine, and various cream sodas. 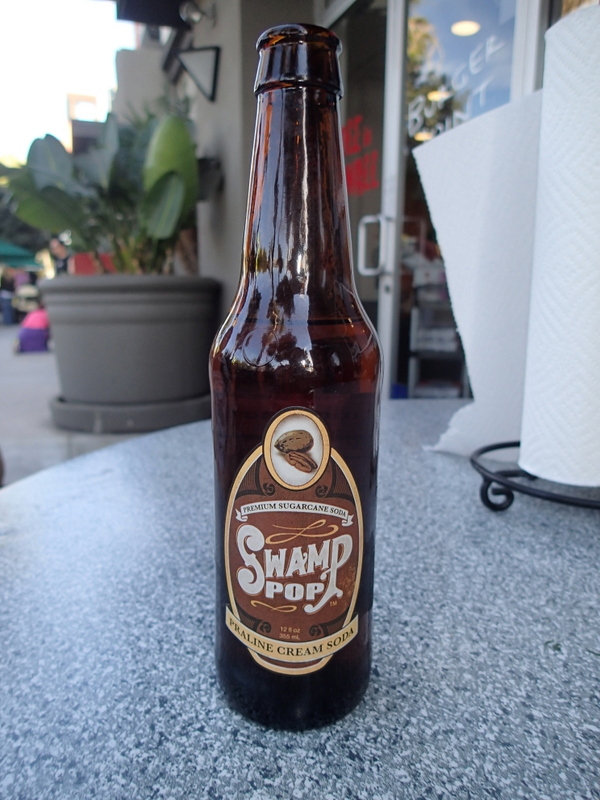 I just had to get the praline cream soda from Louisiana. It was a little scarily sweet, but I appreciated the opportunity to try it. 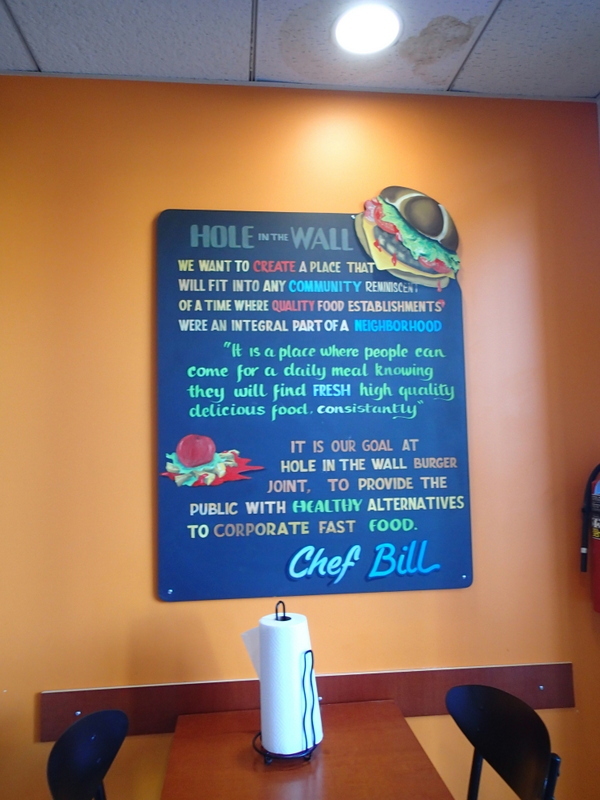 Bottom line: We all gave Hole in the Wall a solid B for its burgers. We would return if we were in the neighborhood, though we probably wouldn’t drive across town just to go. The pretzel buns and fun beverage selection give it an edge. 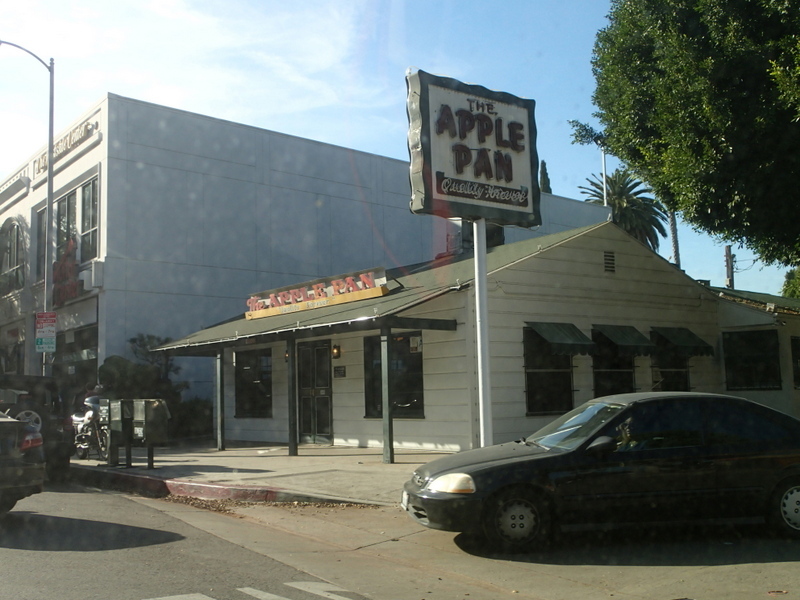 Stop #2: The Apple Pan, West L.A.
…is the inside of The Apple Pan! It’s just one giant counter (and in the middle of the afternoon, well past peak lunchtime, we had to wait for seats). 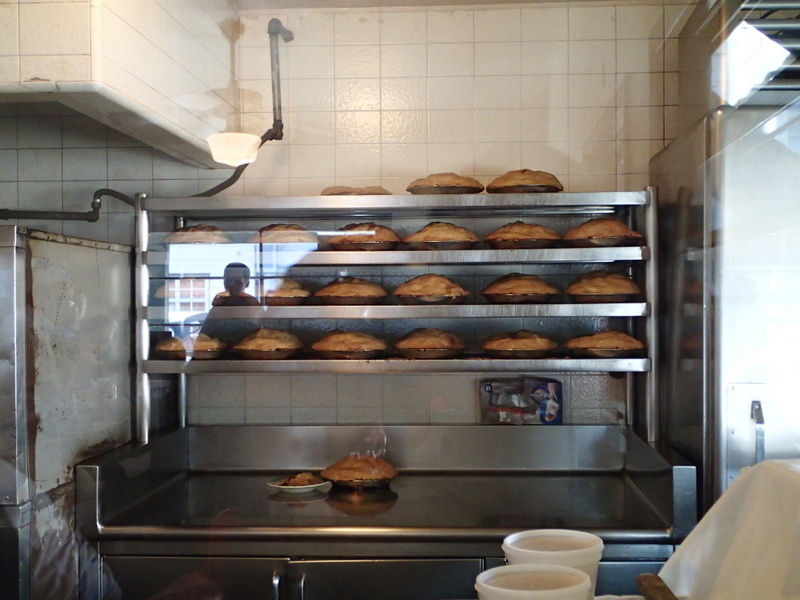 But while you wait, you can gaze into the back kitchen, where rows and rows of deep-dish apple pies wait to be cut up. 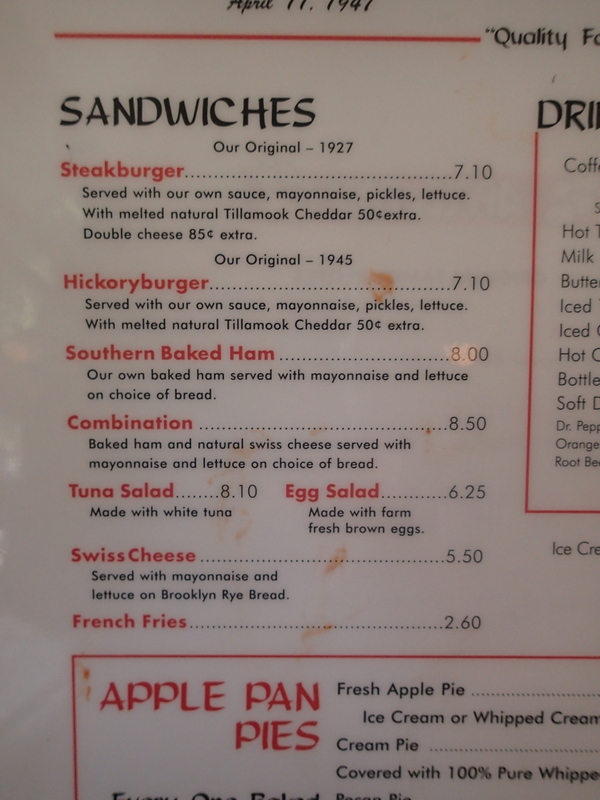 The menu features two “original” burgers–the Steakburger and the Hickoryburger–so we had to try both. Meat: These are thinner, smaller burgers than most of the other entries out there. 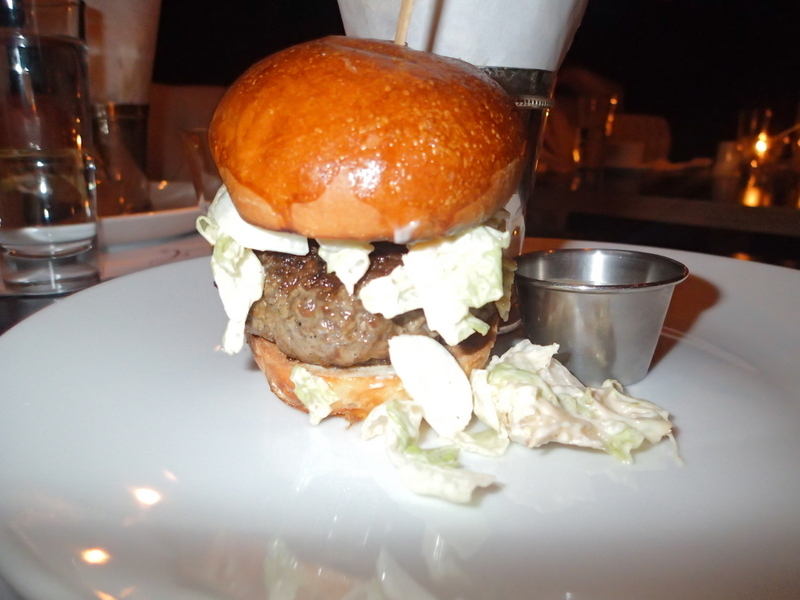 While no one found the steak burger remarkable, we all agreed that the hickory burger had excellent flavor. Worth mentioning: The beverage selection was poor (no shakes or interesting sodas). The pies looked amazing, though, and it wasn’t until we were a neighborhood away in the car that we realized we really should have tried a slice while we were there. Our mistake. Bottom line: The Steakburger got a B- from everyone, while the Hickoryburger’s grades ranged from B- to A- for an average grade of B/B+ (terrific meat surrounded by lackluster everything else). However, The Apple Pan gets an A for atmosphere, and we’d go back to try some of that pie, at the very least. 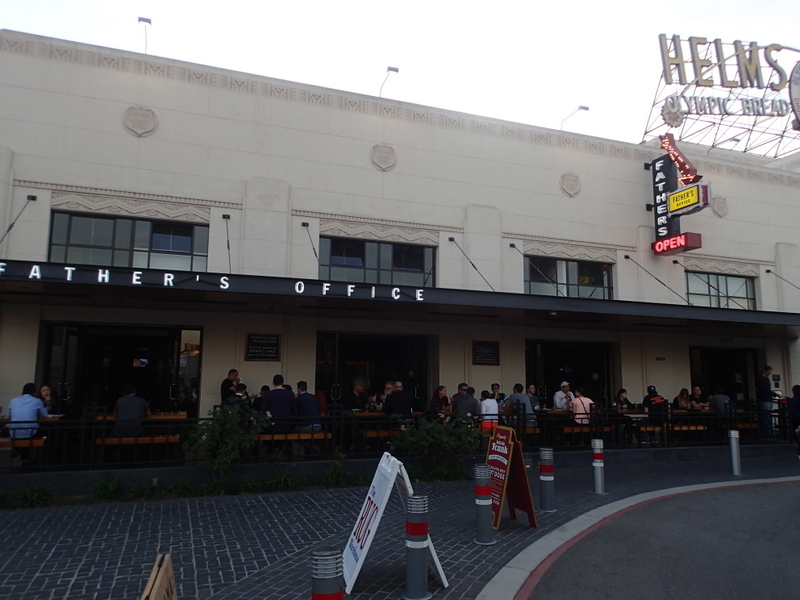 Father’s Office makes a lot of “best burger in L.A.” lists–but the thing is, they won’t do any substitutions. And since Andy doesn’t eat cheese (and I don’t like melted cheese), that meant that their famed burger (which contains gruyere and blue cheese, as well as bacon and arugula) was untasteable for us. And by the time we got there, Katie and Jason were burgered out, so we didn’t end up having a burger there at all. We couldn’t pass up dessert, though. 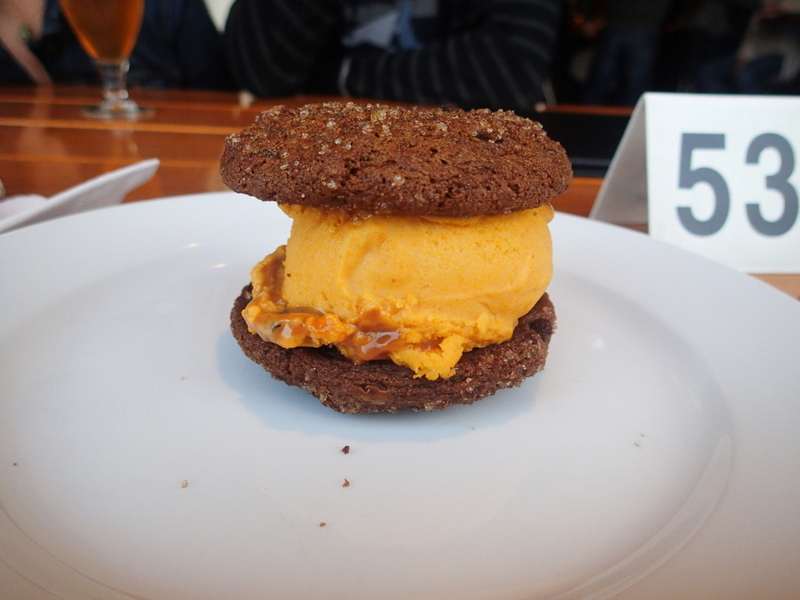 Here’s the gingerbread ice cream sandwich with pumpkin ice cream (looks kind of like a burger, no? 🙂 ) And even better was the sticky toffee pudding a la mode. YUM. Nice desserts and beer list. Couldn’t try the burger, so if you’ve had it, feel free to weigh in in the comments. 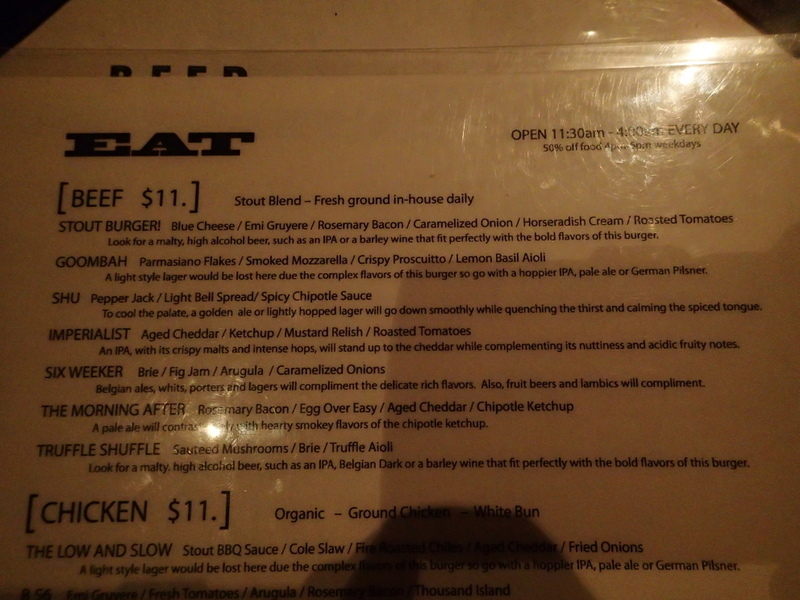 Stout, which focuses on burgers and beer, was a late addition to our first-day agenda…but a great one. Read on. This is a sit-down, table-service place, though it’s not fancy or fussy. And while you can’t mix and match toppings here, you can have them removed, which is what Andy and I did to the cheese on our choice, the “Truffle Shuffle.” Jason had his burger mojo back by this point and went for the “Goombah,” while Katie sampled the bean-and-quinoa a veggie burger. Bun: This is a tall, substantial bun–very aesthetically pleasing in its perfect roundness. Condiments & Toppings: Stout eschews the typical lettuce/tomato/pickle for its own custom topping combinations–and we think they should keep at it. 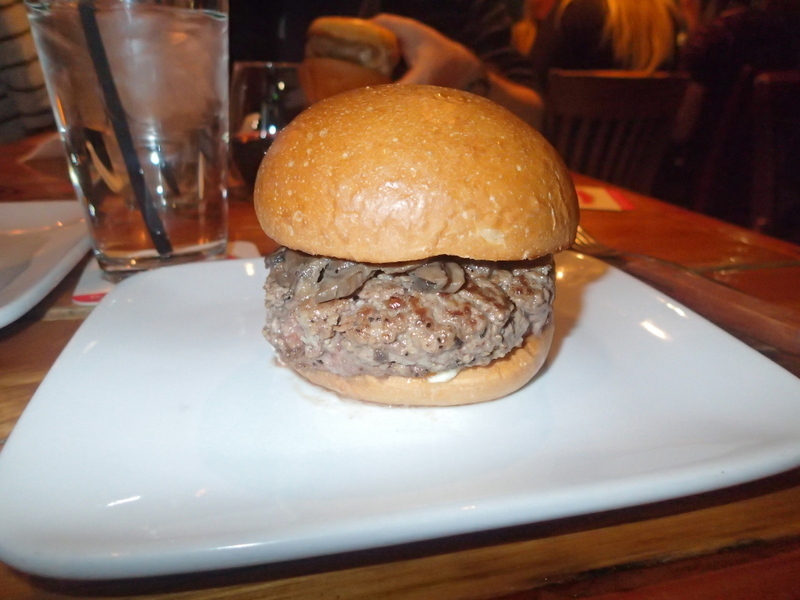 The sauteed mushrooms and truffle aioli on Andy’s and my burger was terrific, and Jason loved the combination of cheeses and prosciutto on his. Worth noting: Our side of sweet potato fries was definitely worth ordering–a good “crunch to softness ratio” as one of our tasters (okay, I) put it. 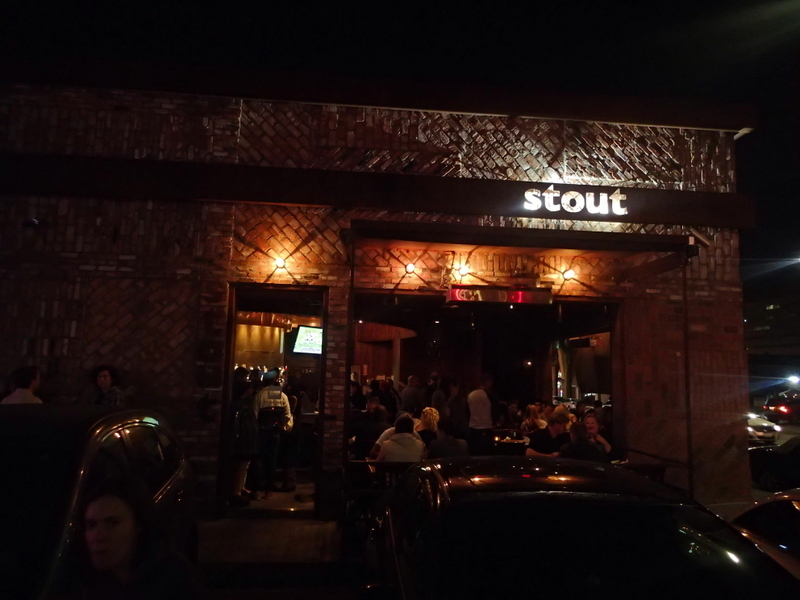 The beer and wine list is extensive and was enjoyed by Katie and Jason; Andy and I would have liked to see more interesting nonalcoholic options, but at a place called “Stout,” we weren’t going to hold our breaths. Bottom line: Solid A- grades across the board (including for Katie’s veggie burger). As Jason said, the whole experience just worked altogether. We’d definitely go back to try some different varieties. Moving now from the gourmet to the…less gourmet. 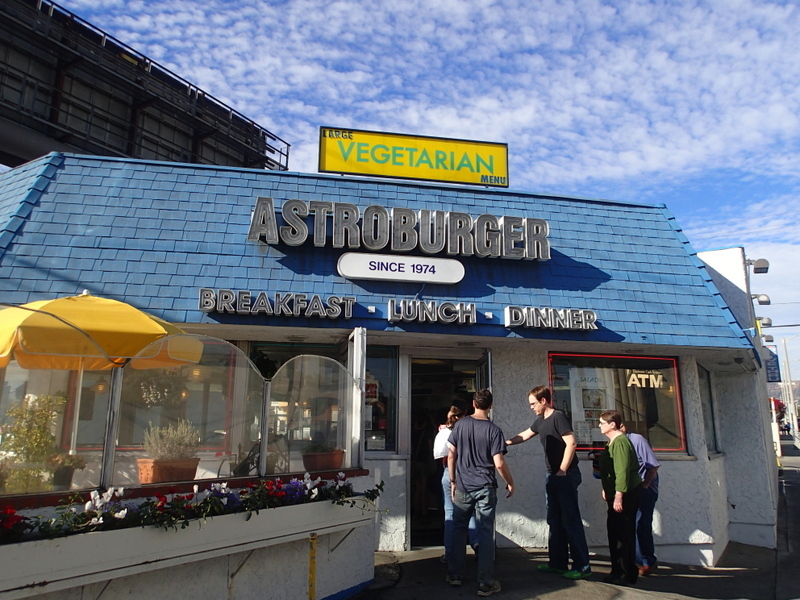 We kicked off day 2 of burger-eating at Astro Burger, which Katie described as having a “Greek diner meets fast-food burger joint” vibe. Condiments & Toppings: Toppings were average/disappointing: bland shredded lettuce and mealy tomato. Katie and Jason got an avocado burger, and the avocado was nice and fresh, but Katie said it added more texture than flavor. 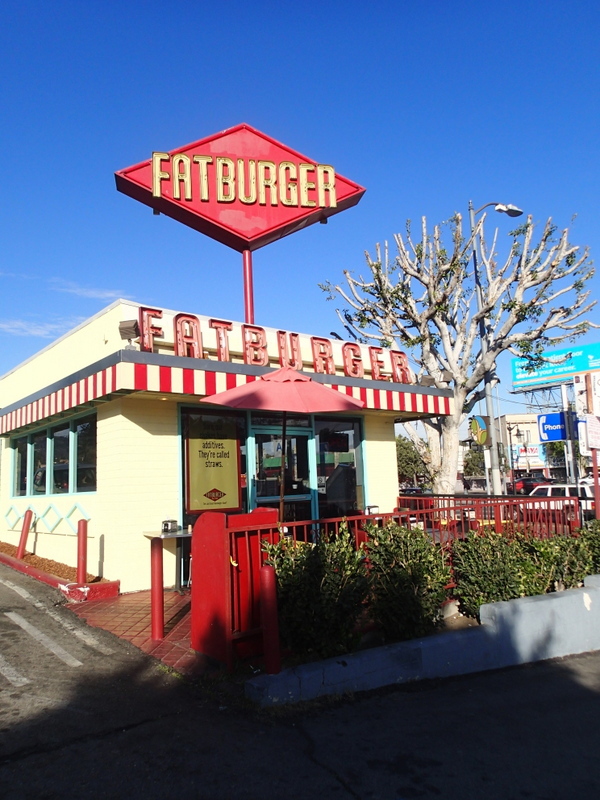 On to Fatburger, a California chain. Apparently, most of them look like generic fast-food joints, but this one was very cute! Meat: Katie and I both found the meat to be tasty, and I liked that the patty was thicker and more substantial than the Whopper/Astro Burger style of fast-food burger. Andy, on the other hand, found it bland and said the burger taste was overpowered by the relish. Jason said that, of the fast food chains, it’s the best by far. Bun: Andy enjoyed that the bun was toasted, and Jason said his didn’t get greasy. Katie found it unremarkable; I thought it was a step up from the average bun. Condiments & Toppings: We all agreed that the relish was strong, and that pickles + relish is probably overkill on this burger. Next time, we’d pick one or the other. Worth noting: Katie and I split a red velvet shake, and appreciated the novel flavor, though we wouldn’t run back for another one. Bottom line: No one gave Fatburger the same grade; they ranged from a C- (Andy) to a B+ (Jason) for an average score of B-. Three out of four of us would come back, and I would definitely choose Fatburger over In & Out Burger (which we didn’t visit on this trip, but which we have tried twice before–I’m just not a fan). Oops, forgot to take a picture outside of this restaurant…or inside…or of anything but the burger. (But oh, what a burger!) Briefly, Comme Ca is a fancy French bistro where the burger–while being the most expensive of our quest–is by far the cheapest entree on the menu. It comes with skinny French fries, strong garlic aioli for dipping, and a crunchy, salty slaw as the burger’s only condiment (unless you have yours with cheese, also an option). Meat: Ah, subjectivity. Andy found our burger to be “flavorful but a little dry,” while Katie said her cheeseburger was “fairly juicy but not so flavorful.” Jason and I both thought ours had great flavor and texture. Condiments & Toppings: We were fans of the salty slaw…well, except for Jason, who said “it’s not a slaw.” Though, actually, I think he still liked it. Worth noting: The fries and aioli were delicious. If $14 cocktails are your thing, Comme Ca has plenty of them to choose from, and according to Jason, an excellent wine list. Not so much of interest on the nonalcoholic side. The one dessert we tried, a caramel pot de creme ($8) was amazing. All that said, our service was kind of off–and when I’m eating at a place this pricey (entrees other than the burger were around $30), I kind of expect the server to be a little more knowledgeable and on-the-ball timing-wise than ours was. Bottom line: Our grades ranged from B+ to A, averaging B+/A-. Jason and I both named it our overall favorite burger, but for the group, it came in a close second to Stout. If you’re looking for a swanky evening out during which you can still enjoy a burger, this is a great destination. From the priciest burger of our quest to the cheapest! 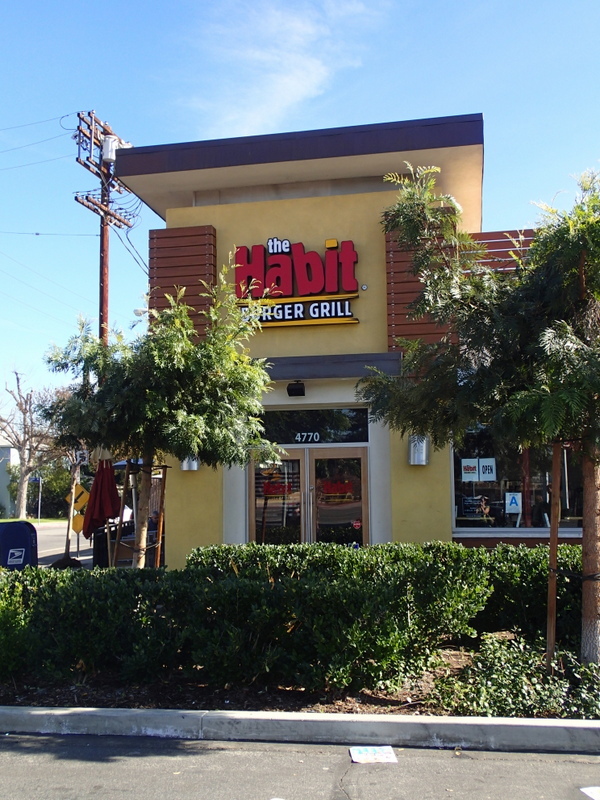 The Habit is another California chain, and we visited the North Hollywood location, which is in a strip mall. 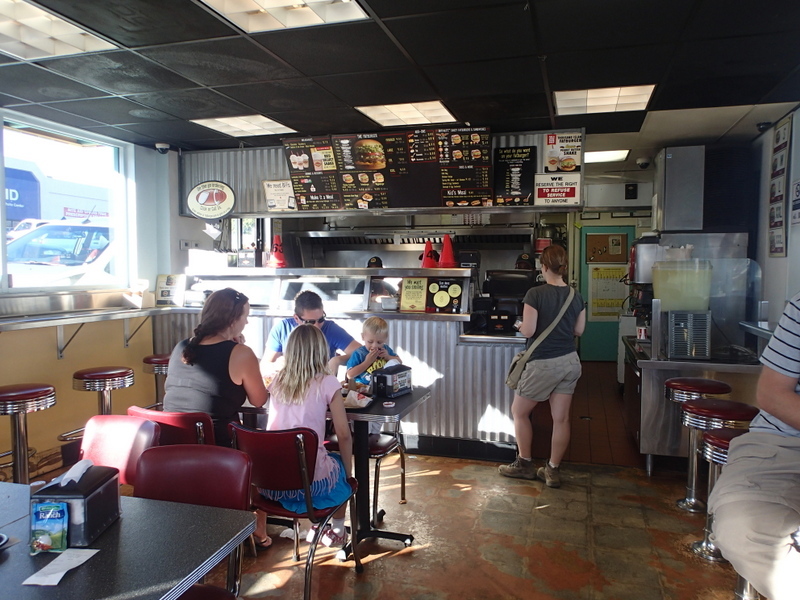 No picture of the interior, but I thought it was a step up in decor and cleanliness from Fatburger, while Katie likened it to a Panera or Starbucks. The basic burger choice is the Charburger, which comes with mayo, pickle, lettuce, tomato, and caramelized onions on a toasted bun. 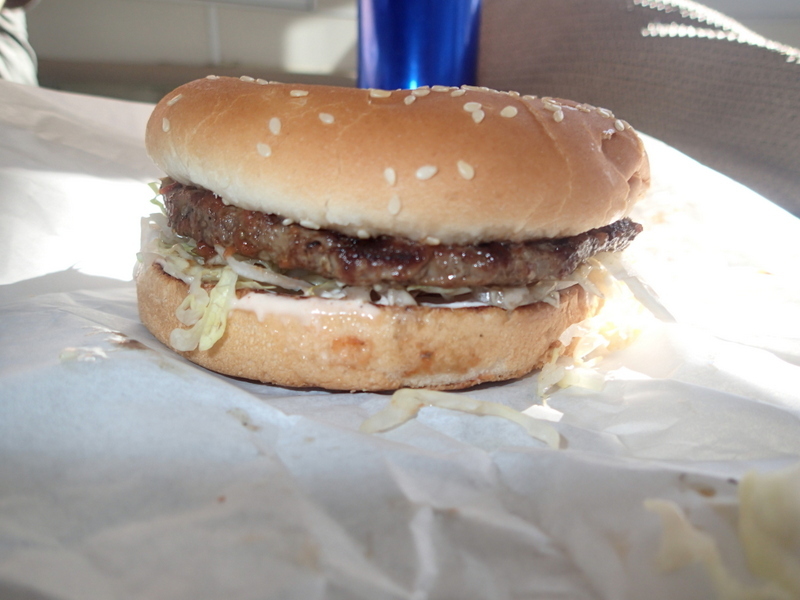 There are also a few other variations, such as the Teriyaki Charburger (featuring pineapple), which Katie and I tried. Meat: No one was blow away by the meat. Andy said it tasted like “a slightly less charbroiled Whopper,” and Katie felt it got a little lost among all the condiments. Condiments & Toppings: Habit seems to go with a “more is better” condiment and topping philosophy, though Andy said that the caramelized onions on his burger were a nice touch. Worth noting: Sweet potato fries were tasty. Shakes are available, and our malt vanilla shake was fine, though nothing to write home about. The price, however, really can’t be beat. 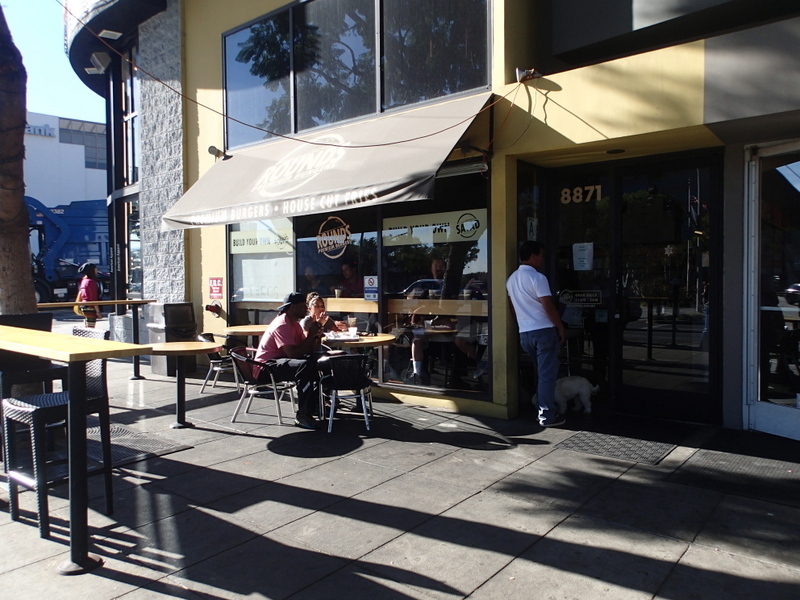 Rounds is a little storefront on Santa Monica Boulevard in West Hollywood. Not terribly exciting outside or inside. 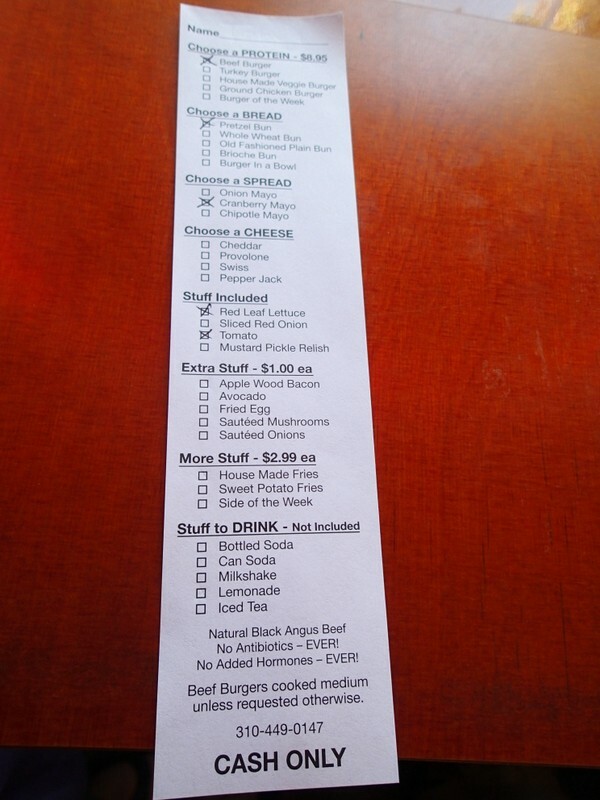 Like at Hole in the Wall, you build your own burger by ordering off a handy checklist. We stuck to the basics, but chose chipotle ketchup off the list of sauces. Condiments & Toppings: The toppings were pretty average; I wished that there had been fresh green lettuce instead of shredded iceberg. 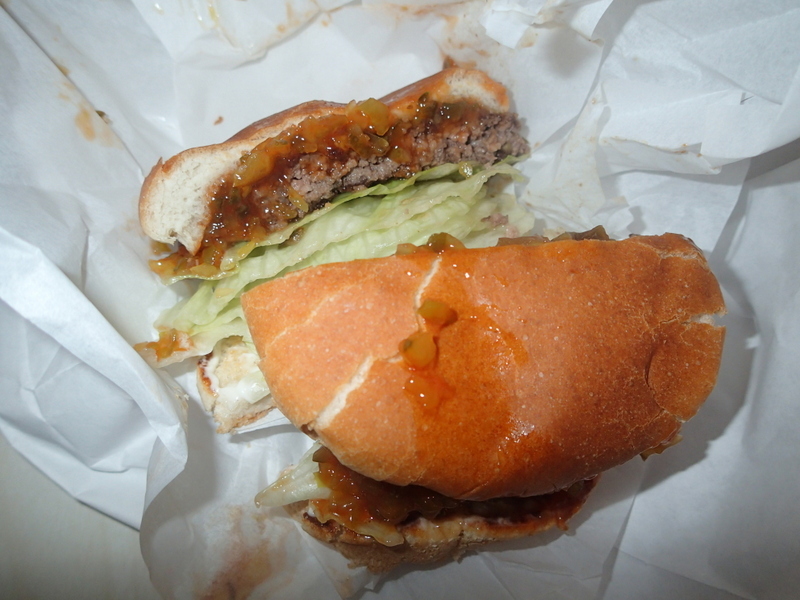 Also, while we thought the chipotle ketchup had a nice level of spice, it was too cold, even on a hot burger. Worth noting: Drinks were uninspiring–no shakes, and just fountain sodas–and sadly, there is no public bathroom. Bottom line: Our average rating was a B/B+. At $5.45, we all agreed that a Rounds burger is great value for the quality, and that if we were in the neighborhood, we’d make the effort to come back by. In fact, I’d be willing to pay a few dollars more for the same burger on slightly nicer premises, with a bathroom and better drink options. 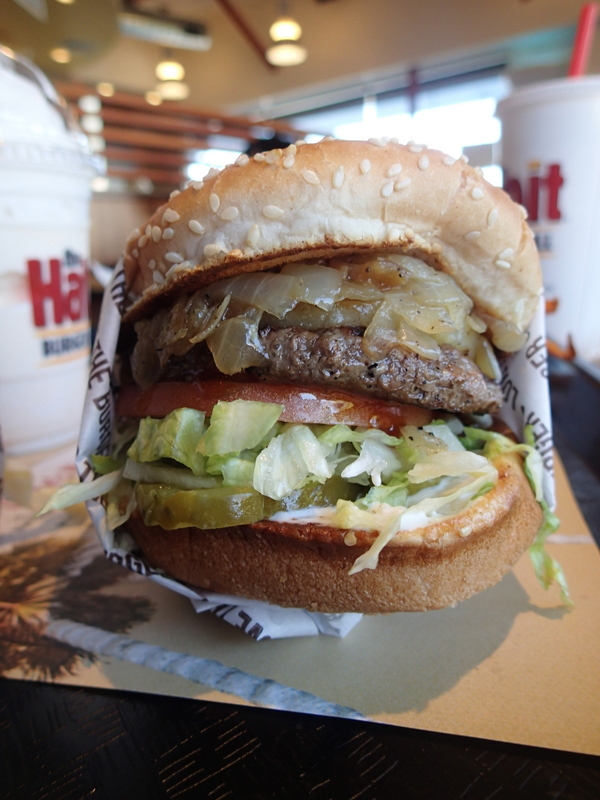 Thus concludes our burger tour of L.A.–perhaps the first of many! Our winner overall was Stout, closely followed by Comme Ca. Best meat goes to The Apple Pan for its Hickoryburger. 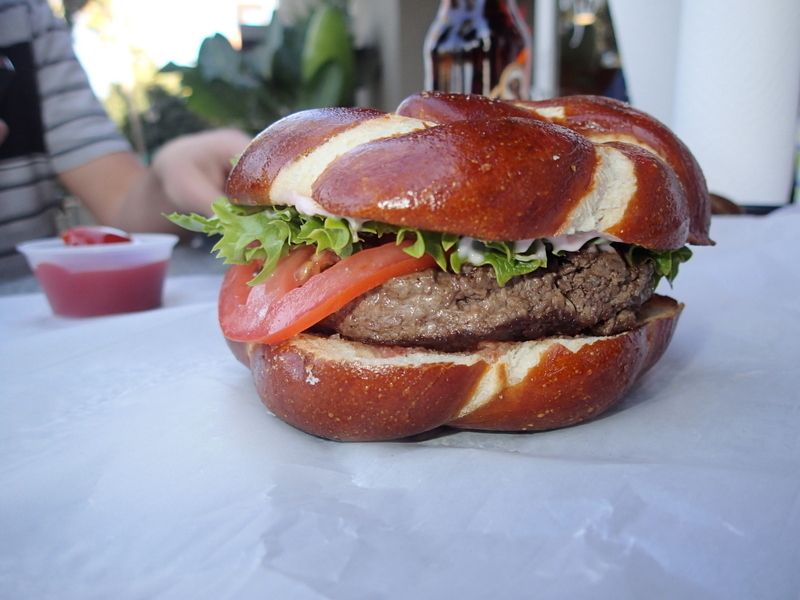 Best bun was the pretzel bun at Hole in the Wall. Best toppings were found at Stout. 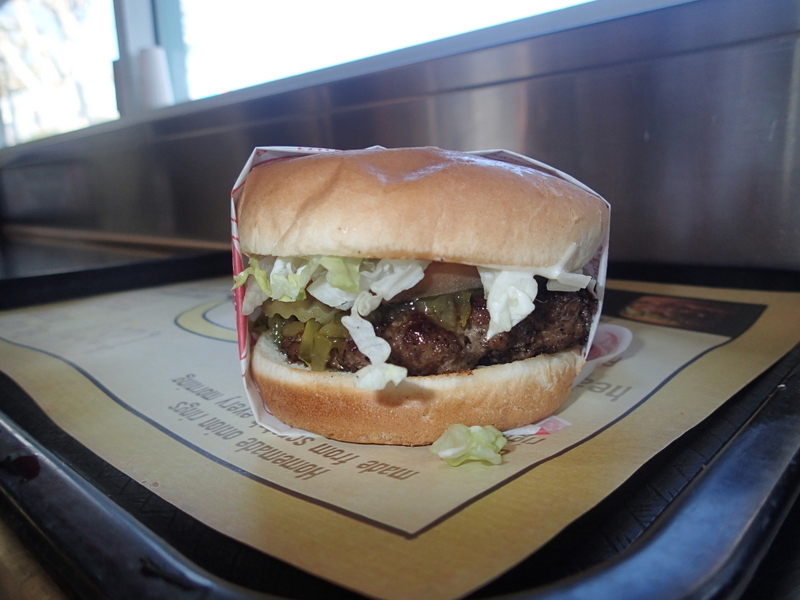 And for best fast food burger, Fatburger edges out The Habit. Your first chance to win a copy of ALL FOUR STARS! 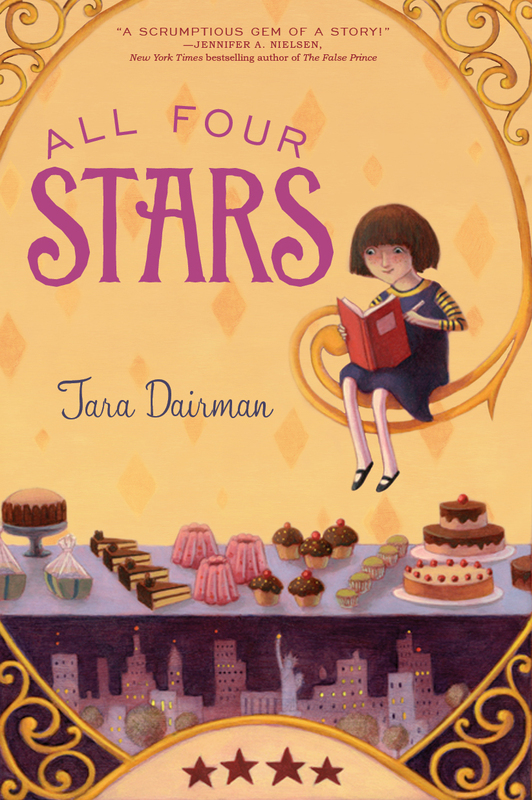 Just a quick note to let you know that the wonderful Krista Van Dolzer is giving away an advance copy of my debut novel All Four Stars over at her blog. This is your very first chance to win an early copy, more than six months before it hits the shelves on July 10! 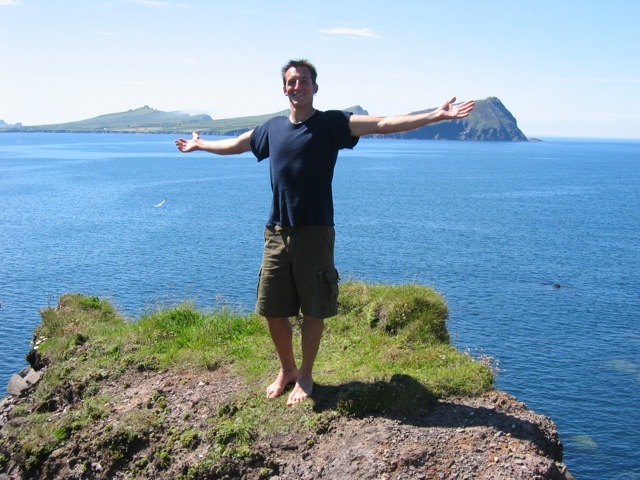 When I first created this WordPress blog in 2012, I quickly stumbled upon the “Freshly Pressed” page, which seemed to feature all sorts of interesting-sounding blog posts. “Wow, it would be pretty cool to get one of my posts up on this page,” I thought. But I assumed it was basically impossible, and soon forgot all about it. Fast-forward to January 6, 2014, and my first post of the year on the group author blog I contribute to, Emu’s Debuts (also with WordPress). For once, instead of throwing something together at the last minute, I actually had most of a piece drafted in advance, reflecting on a surprising phone call I’d recently had with my mom. I’d pretty much been on writing hiatus since early December, when I’d turned Gladys 2 into my editor, so maybe my brain was really itching to tell a story. In any case, I felt pretty good about how this piece had turned out, and was pleased that within a few hours of posting, it seemed to be striking a chord with our blog’s regular commenters and even with some of my friends and family members. Anyway, the next couple of days saw a great influx of visitors and commenters to our group blog–and while I tried to brace myself for the backlash and nuttiness that I know exposure to the Internet-at-large can bring, I have to say that the notes and stories that have been shared on the post have been really lovely so far. I don’t write to get people to like me, but at least for the past couple of days, I’ve kind of felt like the Internet was giving me a hug. It was a nice way to kick off my debut year. So, all of this excitement has led to a little reflection on my part. I don’t usually blog about personal stuff, but I guess I need to acknowledge my two most successful blog posts of the last year*–the ones that got the most hits, yes, but also the ones that triggered the most comments and tweets and e-mails telling me that what I wrote had resonated with someone, or helped them out in some way–were the ones where I did go out on a limb and share some personal experiences. 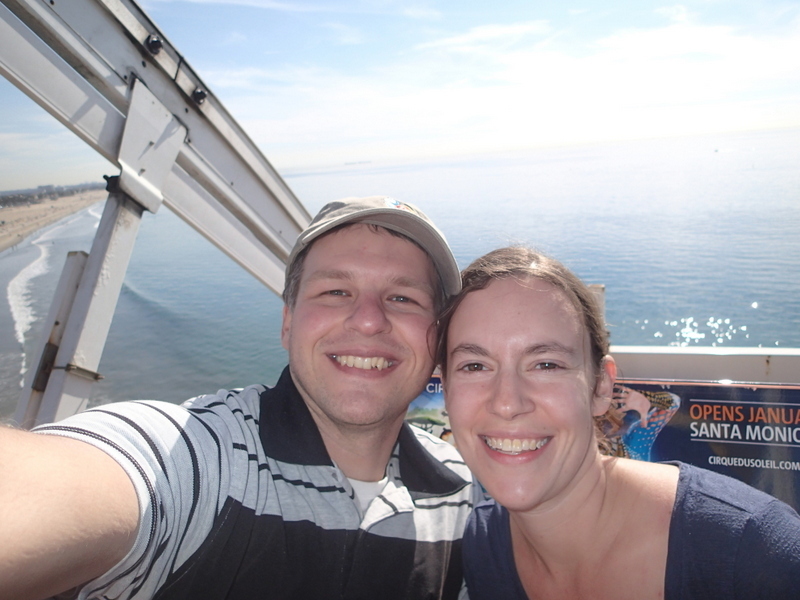 Now, that doesn’t mean that I’m going to turn this blog into a weekly confessional (trust me, no one wants that!). But I know that some things debut authors (and not-so-debut authors) debate about a lot is how best to use social media, and how protective to be of your privacy, and how much of your personal story to put out there. And for me, surprisingly, the right answer to that last question may just be “a little bit more.” Because sometimes, sharing a true story really does help connect you with other people in a genuine way. 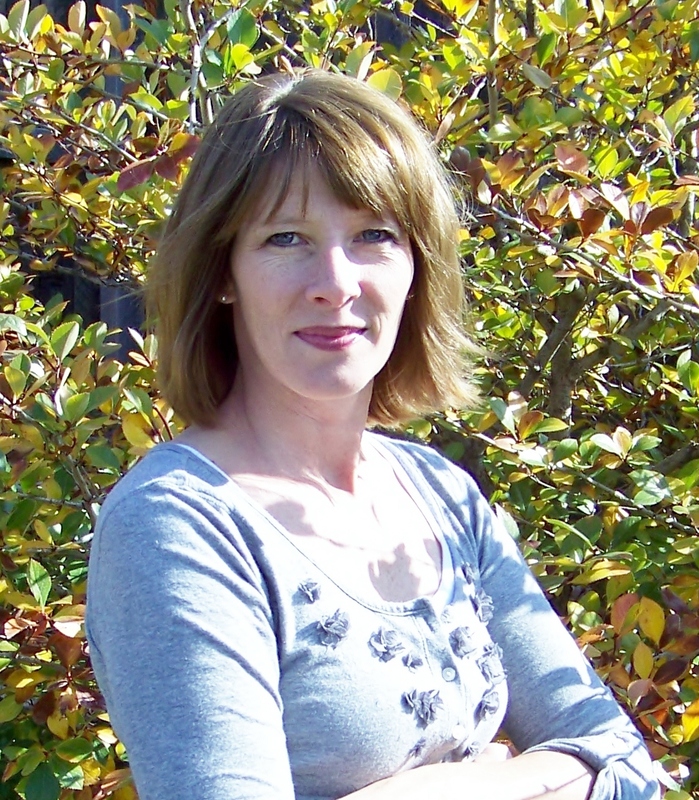 Interview with Colorado author Stephanie Blake! 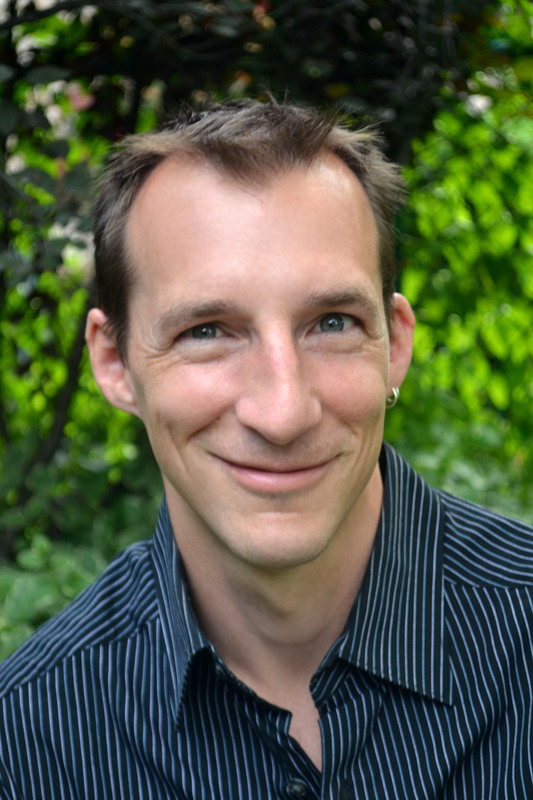 Welcome back to the Colorado is for Writers interview series! Every other Tuesday, I talk to different Colorado-based authors about their work and their connections to this beautiful state. 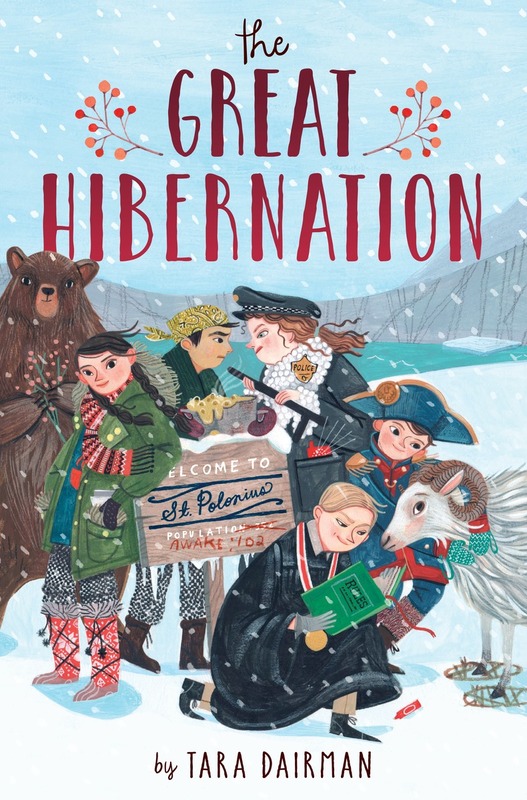 Today, I’m happy to welcome middle-grade and picture book author Stephanie Blake to the blog! Stephanie is the author of the middle-grade historical novel The Marble Queen, which was a finalist for the 2013 Colorado Book Award. Welcome, Stephanie! I was born in Hawarden, Iowa. My parents moved the family to Colorado when I was five. I’ve lived all over this beautiful state. I live in gorgeous Castle Rock. I can see the rock from my backyard and my kids and husband like to hike it. I’m scared of heights, so I have never been up there. I’m always inspired by the other Colorado writers I know. It’s fun to see everyone at the RMC-SCBWI Conference each year. Also, over at OneFour Kidlit, we middle-grade authors are kicking the year off with the opening lines from our books. There are so many terrific ones–I want to read all of these books right now! Tomorrow, I’ll have a new Colorado is for Writers interview up here with Stephanie Blake, author of the Colorado Book Award finalist The Marble Queen. 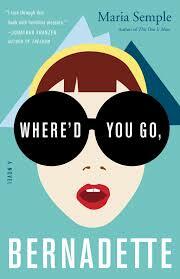 And many thanks to those who checked out yesterday’s post on my favorite funny reads of 2013. I’m always looking for more laugh-out-loud books, so if you have any recommendations, please don’t hesitate to share! Happy new year, everybody! It’s finally 2014—the year I become a published author! All Four Stars hits the shelves on July 10, and it’s already available for preorder from your local bookstore and all the major online book retailers. Exciting! I’ve really been enjoying reading other people’s year-end roundups of their reading statistics and favorite books from 2013. This year I read 68 books, which I believe is a record for me. Getting a smartphone and subsequently borrowing lots of audiobooks through Overdrive definitely helped bump up my numbers; I listened to 19 audiobooks this year while doing dishes, folding laundry, and walking around running errands. Another big proportion of my reads this year were ARCs, or advance copies of books that aren’t published yet; I read 19 of those. The majority of them are 2014 releases, and I received them on rotation through either OneFour Kidlit or Emu’s Debuts, the groups of 2014 debut authors to which I belong. The rest of my reads were a mix of middle-grade, young adult, and adult, a mix of purchased in paper, purchased for my e-reader, and borrowed from the library (both in paper and on my e-reader). I also read a handful of terrific picture books (which I’m not including in my final book tally, but enjoyed just the same). There were so many books that I loved this year, but for this post, I’ve decided to highlight my favorite funny reads. I love humor—I write humor (or try to, at least! )—and I often feel like humorous books get short shrift when it comes to awards and recognition. But writing truly funny prose takes tremendous skill, and reading something truly funny is just the best elixir for a cruddy day, or month, or year. 2013 was a tough year for my family and several of my friends (hurricanes, floods, family illnesses, etc. ), but the following books definitely helped me through some challenging stretches. Absurd, adorable, and perfectly illustrated by Anne Wilsdorf, this is a book that kids and adults will savor reading over and over again. 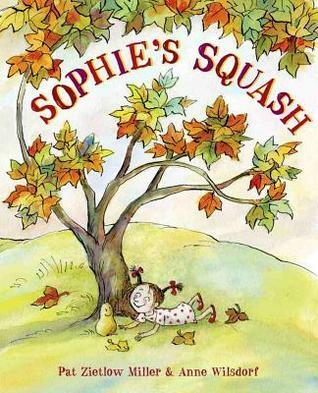 Reading this book was a joy from beginning to end. 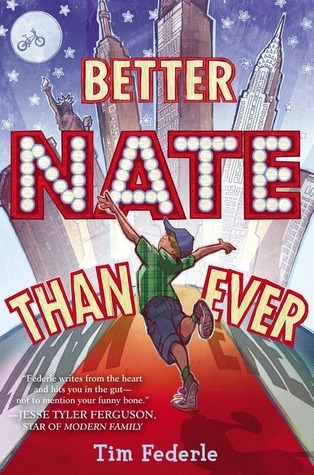 Tim Federle starts the book off with a premise ripe for comedy (boy who has hardly ever left his hometown sneaks off to New York City to audition for “E.T. : The Musical”), but it’s main character Nate’s voice that truly sets this book apart. As is often the case with great humorous writing, there’s an undercurrent of pain and insecurity that makes Nate feel all too real. I’m thrilled that a sequel (Five, Six, Seven, Nate!) is coming in 2014. 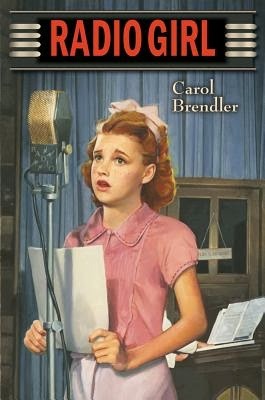 Set in the 1930’s, this upper-middle-grade novel follows the exploits of Cece, who desperately wants to become a radio star (and isn’t afraid to do a little sneaking around to make her dream come true). 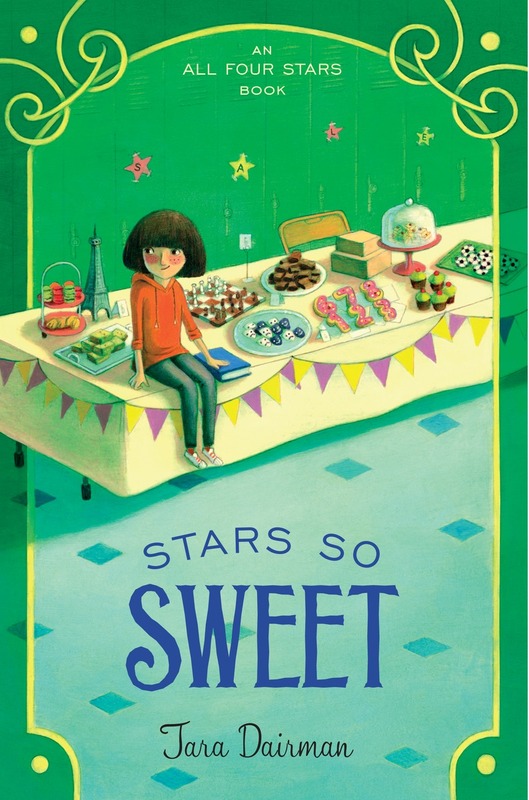 Well, if you know the plot of All Four Stars, you probably won’t be surprised to hear that I loved this story, but in addition to the girl-taking-on-her-dream-profession aspect, I adored the humor in it. Cece has a charming innocence, but also a healthy disrespect for authority that leads her into some truly farcical situations. There’s one scene in which she and her friend Bev read a cousin’s steamy diary entries that, when Carol read it aloud at our EMLA retreat last summer, had everyone rolling on the floor laughing. Get excited for August 2014, when this debut middle-grade novel hits the shelves! Lauren Magaziner’s voice has been likened to Roald Dahl’s, and in my opinion, the comparison couldn’t be more apt. 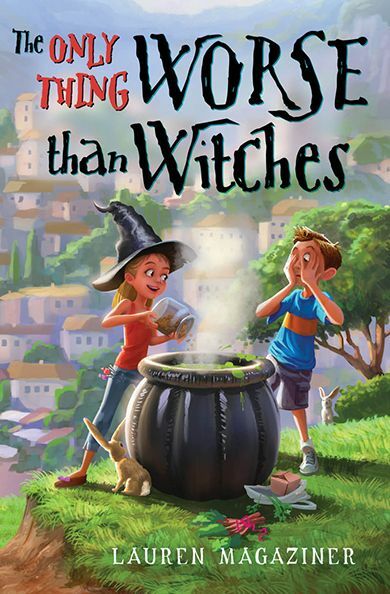 I was laughing out loud from the very first chapter, as we learn about the horrible Mrs. Frabbleknacker, teacher to our hero Rupert—who goes on to have many hilarious adventures as a witchling’s apprentice. Kids are going to LOVE this book…and I bet many adults will, too. 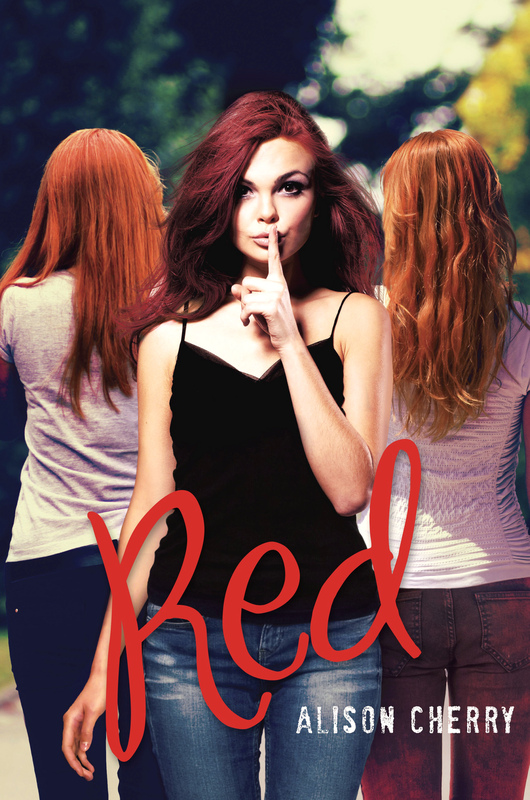 So much of YA these days is dark, but Alison Cherry delightfully bucks that trend with Red, a lighthearted satire about a fictional American town where the redness of your hair determines your social standing. I tore through this book, laughing countless times at its clever turns of phrase—and the 13-year-old reader I gifted it too for Christmas adored it, too. 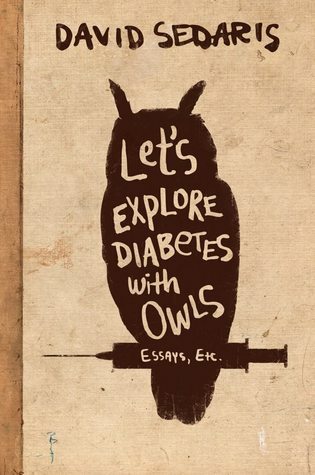 David Sedaris rarely disappoints me, and his newest collection of essays exceeded even my high expectations. I had the treat this year of hearing him try out some new material at the Denver Center (I may also have accosted him in the lobby beforehand to proclaim my ardent admiration). Anyway, this one’s perfect on audiobook, read by Sedaris himself. I’ve already kvelled about this book here on this blog, and at less than $5 on most e-reading platforms, it is a HUGE steal. 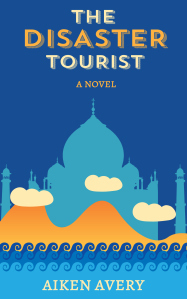 Following a wacky group of college students on a round-the-world cruise, this book manages to be both deep and hilarious at the same time. I’ll never think of Seattle the same way again! Semple amasses a group of characters that are simultaneously absurd and endearing and gives us a window into their world through e-mail correspondence, FBI dossiers, and other “primary sources.” This is also a fantastic audiobook; narrator Kathleen Wilhoite does an incredible job bringing the voices of a large variety of characters to life. Well, there you have it! I can’t wait to see what kinds of laughs 2014 will bring. What were your favorite funny reads of the last year?